This summer my 15 year old daughter went on a mission trip with our church’s youth group. They spent a week working in soup kitches and doing outreach ministry to the homeless – which included handing out blankets and food – and even doing some worship on the streets of NYC (which was probably one of her favorite parts of the trip). She came home with a strong desire to keep helping. She began working in a local soup kitchen but still felt the need to do more. Then she came up with the idea that she wanted to make hats and scarves to hand out at Christmastime in hopes of blessing these people, as well as to help them stay warm. She has now enlisted us as a family (herself, me, and her 4 sisters), plus the help of her youth group. Most of them don’t crochet – but they’re willing to learn! But in order to reach her goal, she needs even more help. Crocheters are some of the most giving people I have ever met. Whenever there is a cause they are willing to invest their time to crocheting and donate to that cause. So I told my daughter I would ask for help. 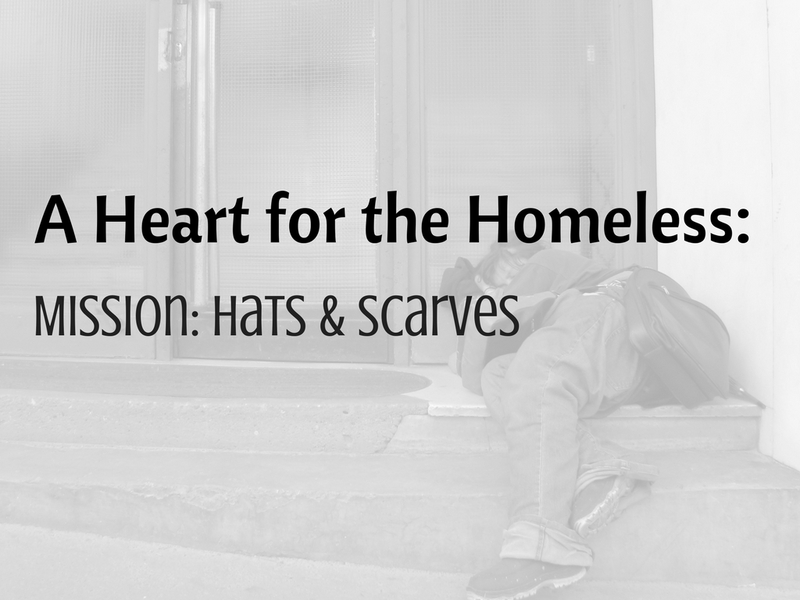 She has set a goal of 1000 hats and 1000 scarves! She will be headed back to NYC to hand them out in November, and our youth group will be handing them out locally as well. She wants every person she comes in contact with to be blessed. Crochet hats and/or scarves. Send all finished items to me before November 15th, 2017. Quick & easy hats and scarves. They don’t need to be fancy, just warm. I will be posting weekly hat & scarf patterns for you to use, but feel free to use any pattern you already have. She is doing this from her heart so I want to bless her socks off. I will be holding all packages that come in, and will go live on my FB page (date TBD) so that you can all be with me when she sees what you’ve done to help her. As a thank you, everyone who sends a package will be entered into a drawing. One winner will receive every premium pattern I release in 2018. Drawing will be held 12/31/2018. Knit or crocheted hats and scarves. Acrylic or wool would be best because they will hold heat better. Any hat or scarf pattern is great! Neutral colors (brown, gray, blues, etc) are better, but not required. My daughter said there are just as many women that could use warmth, so any color(s) are great! Shipping address is available in my Ambassador Crochet Community FB group or by emailing me through the contact form. Make sure you add a note with your name and Ravelry id in case you are the winner. Some have asked about patterns. Anything is great! But I have designed some specifically with this project in mind – so they’re quick & easy. If you have ANY questions please get ahold of me through my FB page or our Ambassador Crochet Community group. This whole thing has touched me on a whole different level – for reasons I can’t share at this point because it’s too hard. But Sarah is an inspiration to me. She has taken a topic that has been very hard on our family (homelessness) and turned it into a positive way she can do her part and I am super proud of her. I hope you will consider helping us. Any color really. I was trying to think not too much girl, but my daughter said it was about 50/50 as far as gender. So she said it really doesn’t matter what colors. Thank you! Hi Doris, I sent you an email.